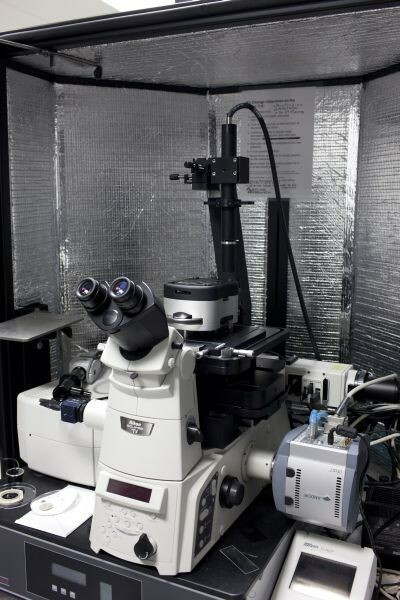 The atomic force microscopy (AFM) is one of the family of scanning probe microscopes, which has grown steadily since the invention of the scanning tunneling microscope by Binning and Rohrer in the early eighties for which they received the Nobel Price for Physics in 1986. AFM builds up a topographical image of a surface by scanning a nanometer sized tip over a surface, much like a braille reader scans a surface with his fingers to build up an image of the page he is reading. 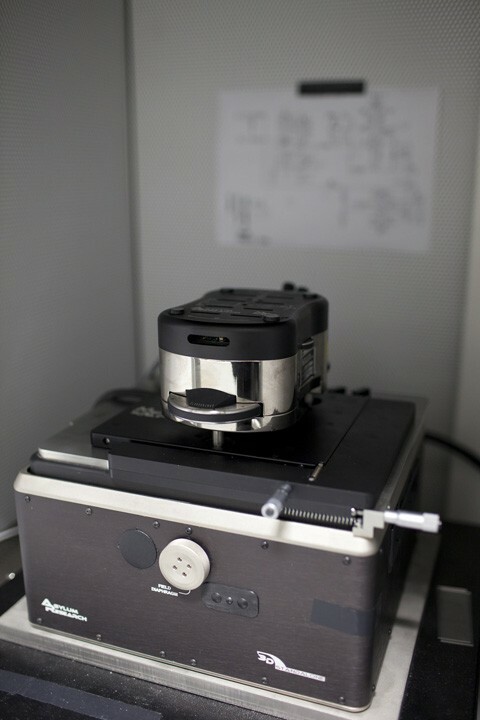 The tip is mounted on the end of a flexible cantilever which responds to changes in the tip-sample interaction as the tip is scanned over the surface. The cantilever response is read out by means of laser light reflected off the back of the cantilever as shown in the figure below. The tip is scanned by use of a piezoelectric material with which the required sub nanometer precision for positioning can be easily reached. Usually the sample is moved vertically as well to compensate for large height changes and to prevent applying large forces to it. A computer builds up the topographical image while the measurement is going on. AFM is also used as a tool for measuring mechanical properties and for mechanically manipulating samples with the probe. 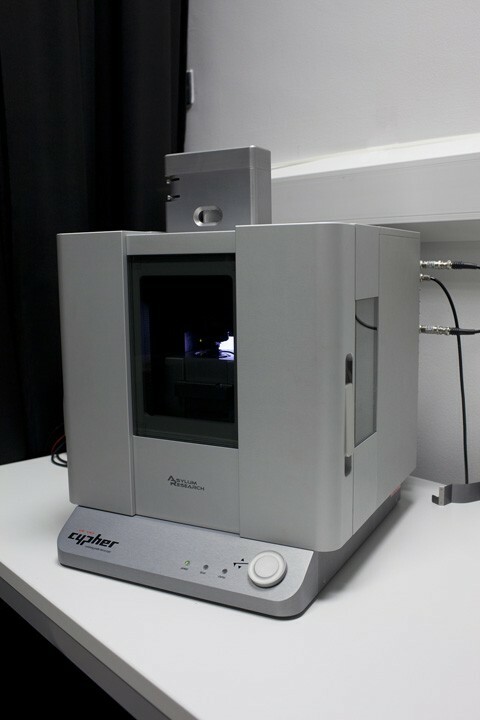 Compared to other techniques such as dynamic light scattering or optical tweezers AFM can apply and measure a large range of forces (multiple orders of magnitude) on samples ranging from tissues to single molecules. The combination with imaging makes it possible to even choose the single molecule on which to do these measurements. 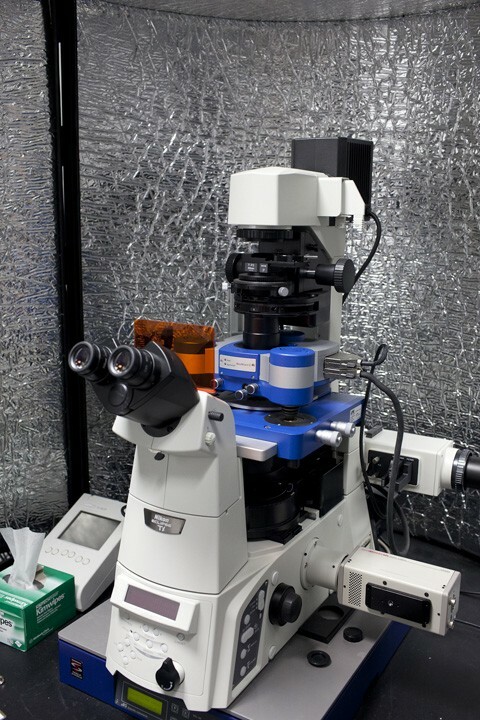 The Nanoscale Function Group has a wide range of commercial AFMs at its disposal from Asylum Research and JPK, either as standalone instruments or in combination with inverted optical microscopes from Nikon Instruments or Olympus. Besides these we also have some in-house developed low noise AFMs for extremely high resolution imaging of biologically relevant systems. 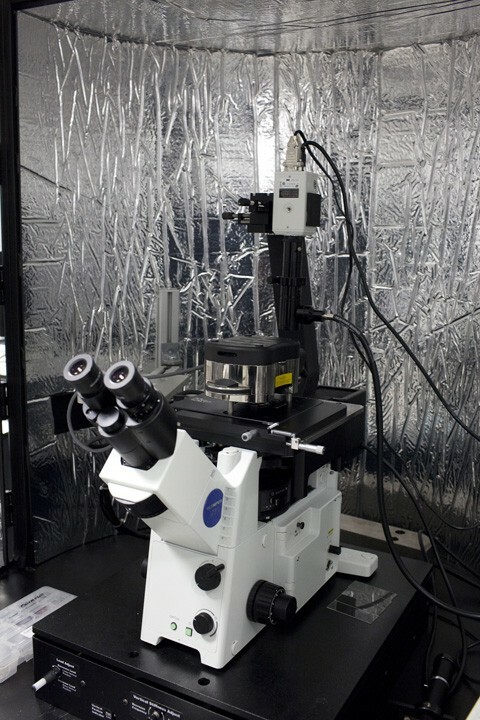 All AFM instruments are capable of achieving sub-nanometer vertical resolution under liquid conditions, and can be combined with various extension kits allowing temperature control, in situ fluid exchange, or custom modes of imaging like magnetic activation and iDrive. All instruments are enclosed in acoustic and vibration isolation hoods to ensure optimal performance. In-situ Fluid Cell Exchange and Temperature Control enabled. Atomic Force Microscope, Binnig, G., Quate, C. F., and Gerber, C., Physical Review Letters, 56, 930-933, (1986). Advances in Atomic Force Microscopy, Giessibl, F. J., Reviews of Modern Physics, 75, 949-983, (2003). AFM: A versatile tool in biophysics, Alessandrini, A., and Facci, P., Measurement Science and Technology, 16, R65-R92, (2005).